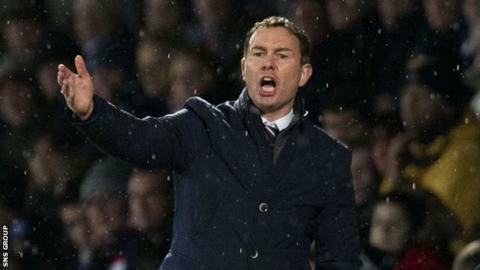 Sacked Ross County boss Derek Adams is proud of his role in the achievements of the Highland club. The 39-year-old has been relieved of his duties after opening the Premiership campaign with four defeats. Adams took the Dingwall side to the top flight in 2012 and finished fifth in the club's first season at that level. "Our 'David' has notched victories against the 'Goliaths' of Scottish football more often than we might have reasonably expected," he said. Adams's father George was also dismissed from his position as director football. The manager, who had two spells in charge at Victoria Park, released a statement saying he had worked with "one of the lowest, if not the lowest, wage bills in the league in the last couple of seasons". And he added: "I am very proud to have represented Ross County as a player and manager in my career. "I would like to thank all of the players who have worked with me, my coaching team and all staff at the club and I would like to thank the board and the chairman for the opportunity to have the honour of working with Ross County and of course the supporters and the local community for their support and for the part they have played in the incredible journey we have taken as a club. "As part of the financial realities of working at Ross County, I have become accustomed to working in a challenging environment. "For the last few seasons, while working with a low-wage budget we have had to build almost entirely new teams to start each season without ever spending a transfer fee which has been a massive challenge that we have been able to meet by retaining our Premiership status. "While this has been extremely challenging, I believe it makes the journey we have taken even more remarkable and I am very proud to have been a part of it. "I have always believed that the test of a manager is in consistently outperforming his resources and I believe I achieve that with Ross County."